This four-star property is a less expensive alternative to its five-star neighbors and neighborhood. 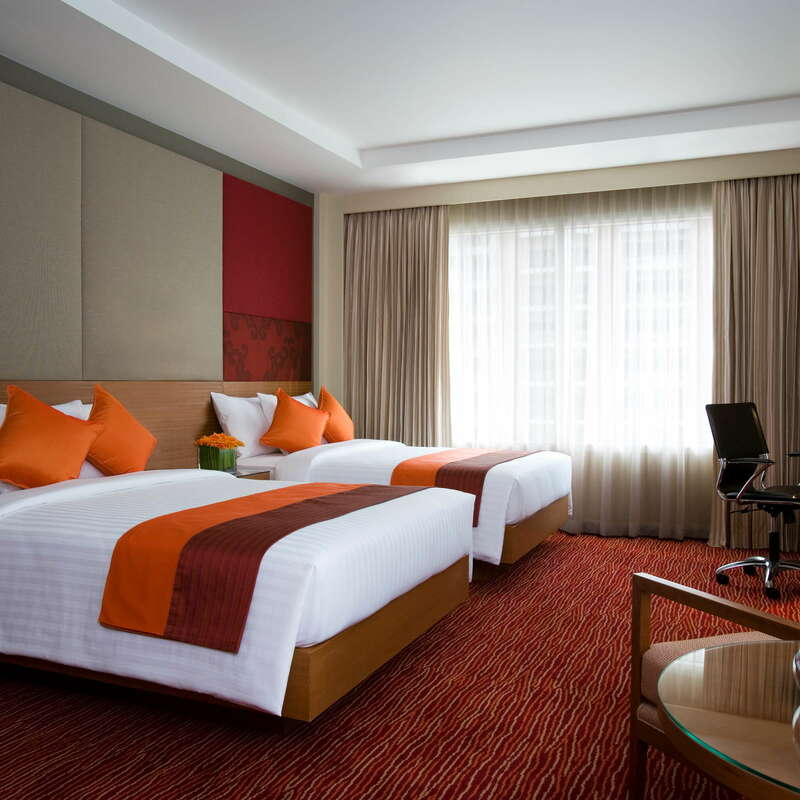 Amongst a sea of skyscrapers, Courtyard by Marriott is a centrally located hotel with easy access to public transit as well as walking distance to any number of great bars, restaurants, and shopping areas. Inside, the hotel provides a number of amenities with a decent restaurant/bar, gym, and spa. 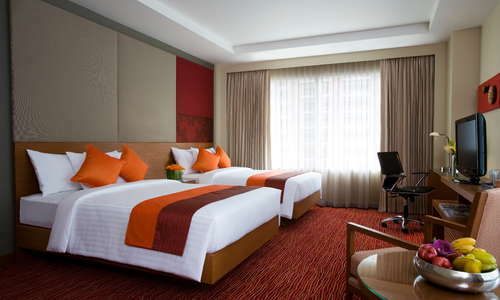 Standard rooms have modern touches and are bathed in browns and reds. Views from the giant windows are exceptional and water is complimentary. If you’re a rewards member, or simply staying in a nicer room, you’ll get access to the Business Lounge with free food, coffee, afternoon tea service, and a happy hour from 5:30 p.m. to 7:30 p.m.
Gray-tiled bathrooms have windows out to the city and into the bedroom. There are also large circular mirrors and Nirvae bath products. Showers are standard without tubs unless you book bigger room types. A casual lobby is more of a pass through with large, wooden book shelves behind the reception desk and a few comfy seating options. A beautiful lap pool is surrounded by cushioned lounge chairs and features a rain shower Jacuzzi on one end. On the other end is a pool bar with full food and beverage service that includes a healthy happy hour from 5 p.m. to 7 p.m. The smallish Thada Heritage Spa has two treatment rooms for massages, scrubs, and more. The large gym has hardwood floors, Life Fitness machines, free weights and views of the pool. There are TVs to distract you from the burn. MoMo Café is the main restaurant for the hotel serving an array of international cuisine for breakfast, lunch, and dinner. Seating options are both inside and out. MoMo Bar is the same as MoMo Café--only with an a la carte menu with tapas and shared plates. 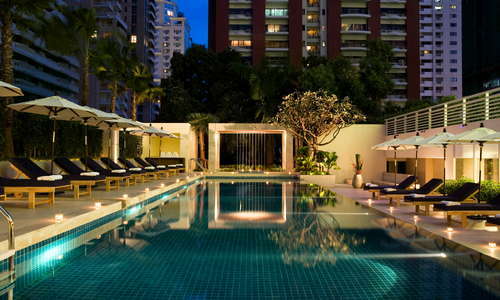 For more drinks, you should head to the pool bar or venture out of the hotel. 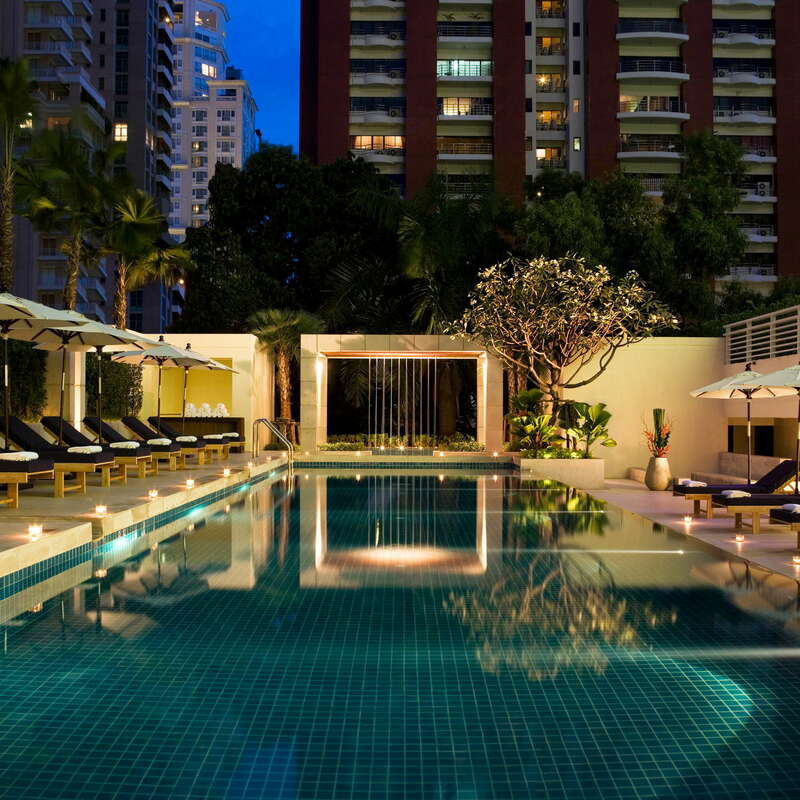 The hotel is in one of the nicest upscale parts of the city, surrounded by five-star hotels, chichi restaurants, and high-end bars, lounges, and shopping areas. It's only a short 3-4-minute walk to the nearest BTS Skytrain station though it’s equally easy to walk to a bevy of restaurants, malls, and attractions. There are usually taxis around here because the hotel is off Ratchadamri Road, which is one of the city’s main thoroughfares. For sushi-lovers you can try Zuma (3-minute walk) inside The St. Regis Hotel. If you want some of the best Indian food you’ll ever taste, head down to award-winning Gaggan (8-minute drive). A truly unforgettable rooftop bar experience can be found at Red Sky (15-minute walk) inside the Centara Grand at Central World. For more surreptitious drinking exploits, check out The Speakeasy at the Muse Hotel (8-minute drive). 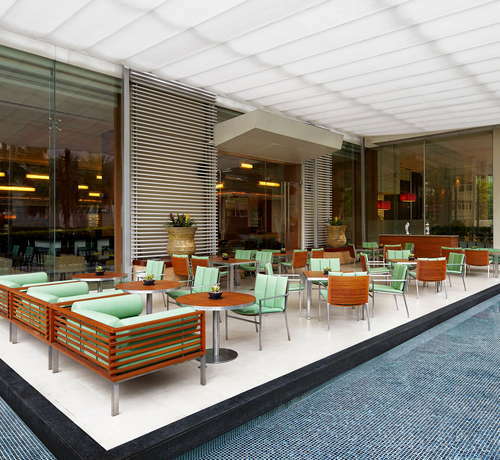 This Courtyard Marriott allows budget-conscious guests to stay in a very high-end area without the hit to your wallet. The hotel has many modern touches, a great pool, and decent food options. With access to multiple Skytrain Stations, it makes life easy getting around the city and to various dining, drinking, shopping, and sightseeing options.